Need a Paiste Symphonic Gong Package (Gong+Stand+Mallet)? 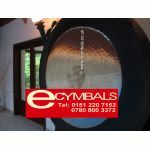 Please email julian@ecymbals.co.uk for a quote. Gongs are musical instruments that have been documented as early as 3500 BC.Gongs have been manufactured by Paiste since the 1930s and Paiste are now acknowledged as the best Gong Manufacturers in the world. 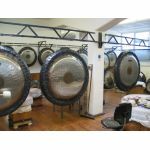 All Paiste Gongs are entirely Hand Made and as well as musical applications are also used in Therapy, Healing, Meditation, Religion and as the Ultimate Announcement Medium (What well known firm of Stock Brokers would not have a large Gong to "celebrate" another deal). Gongs also make decorative pieces in the more salubrious home. Please be aware that as all Gongs are Hand Made to order so Delivery Time can be longer than Cymbals. Also please note that the 80" Symphonic Gong is only suitable for larger buildings. Please note that these prices are for the Gong + Delivery only. If you would like a special Gong Package (Gong + Delivery,Case,Stand & Mallet) Please email julian@ecymbals.co.uk for a quote.